I must admit - I was of the mind, before learning to create product of my own, that moisturizers were for old people and people with lizard skin. Certainly not, MY skin. Crap Oily, sensitive, breakout prone. 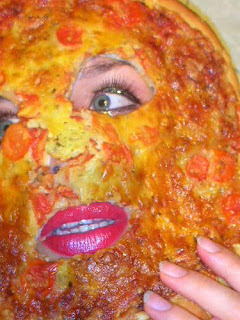 I have since learned that all skin types benefit from a good moisturizer. The trick is getting is right. So what do we want in a face moisturizer? So, along the way I have made several attempts :::coughIwouldn'tputitonmydogcough::: at formulating a good moisturizer. The only way to meet a prince is to kiss a lot of frogs. I spent over a year, and many hours working on it. Not to talk smack, but I see so many out there that people just throw together without any thought other than "I can sell this". Scarier still, is there are so many vendors still insisting that "vitamin e" is a preservative. Yeah. You go ahead and enjoy that bacteria and mold. Ick. 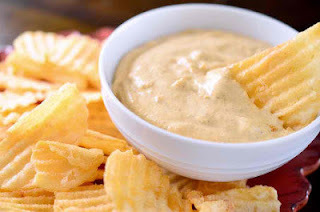 Dip some corn chips in it even, and have a siesta. At it's most basic, a moisturizer is a water and oil emulsion. Let's say I take some coconut oil, some distilled water and an emulsifier and whip them up. Looks fluffy. Feels creamy. Will it make your skin soft? Sure it will. So would Land 'O Lakes butter if you rubbed it all over yourself, but this ain't that kinda party. Is it necessarily a good oil if you get clogged pores and breakouts? Probably not. I'd look like Freddie Krueger inside of 24 hours. So, I set to work on a product that would be sort of a companion to my Gourmet Body Mousse, but incorporate select ingredients that I felt would give the best results for a broad spectrum of skin types. Let's talk turkey. What's in it? Avocado oil- Has natural sunscreen properties, and has great antioxidants. Macadamia Nut Oil - Love this stuff. It's totally BFFs with skin. It is the closest to our own natural sebum and is contains the highest amount of palmitoleic acid than any other plant oil. Palmitoleic acid has oodles of anti-aging properties and has even been shown to slow the rate at which our skin ages. Naturally high in vitamins A&E. Camellia Seed Oil - Cold pressed from the seeds of the camellia flower. It won't clog pores, it absorbs rapidly, and it's unique makeup allows it to penetrate to the deepest layers of the skin. Unrivaled emollient. Red Raspberry Seed Oil: Exceptionally high in Vitamin E, wonderful anti-inflammatory shown to be effective in soothing irritation, eczema, psoriasis and is full of antioxidants. It creates a lipid barrier for skin protection. Extracts such as carrot seed, calendula, and chamomile: Anti-inflammatory, reduces irritation, antiseptic, has healing properties, increases elasticity, balances, and puts to work those antioxidants. Hydrolyzed Oats - I use gobs of this stuff. Shameless pimper of it with no apologies. Soluable form of whole oats. Soothes, and makes your skin feel velvety and awesome. 'Nuff said. Squalene - Naturally present in your skin and is a valuable moisturizer. C12-15 Alkyl Esters: Found naturally in things like coconut oil and cranberries. Softens, conditions and smooths the skin and imparts a fantastic silkiness. And lastly.....the piece de resistance - Hyaluronic Acid. This is the showpiece of this cream. You have probably heard chatter about this ingredient, if you are at all in tune with what's going on in cosmetic trending. It's not cheap, I'll keep it real with ya. But completely worth it. HA is a naturally occuring active often touted as the "key to the fountain of youth". I won't get quite as Ron Popeil on you, but I will say that it's good stuff. HA holds 1000x it's weight in water (hello moisture!) and is a biopolymer naturally occurring in the skin and other tissues. Topically applied, hyaluronic acid forms an air permeable layer (so your skin can breathe), penetrates into the dermis, and boosts the elasticity and hydration of the skin. 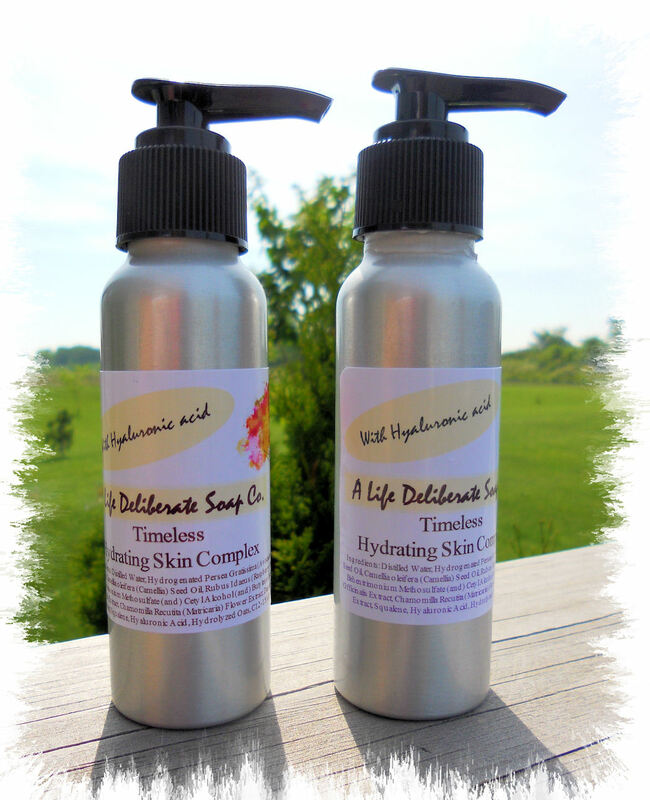 "I'm writing you to let you know that your Timeless moisturizer is GOOD stuff! My skin is loving it. I don't want to rush and say how good a skin care product is after using it for a few days or a week. I have skin that's easily upset. My skin will start to break out in a few hours after I wear certain foundations, or moisturizer, or anything it comes in contact with. I have oily, dehydrated skin. I'm in my mid 30's yet still break out like a teenager if I'm not careful. My skin is decent because I'm careful with the products I put on it. Lately I'm trying to find skincare that's more natural, less chemical...and every "natural" product I've tried broke me out that I kept returning to my chemical skincare (but works good for me). Since I really like your soaps, I decided to give your moisturizer a try. I'm so glad I did. It moisturizes without being greasy. It works nicely with my serum. I can wear it under make up without making my face look like an oil slick. My skin feels so soft and silky! I've been using this for more than 3 weeks and haven't seen any break out or allergic reaction. I don't have a youtube channel or a blog to review products or haul, but I want you to know that I love every single product I've tried from you:)"
Nothing I can ever say is as valuable as good old fashioned customer testimonials. I hope you try it and enjoy it, as well. If you do - let me know how it's working for you. You make me want to EAT it! Oh, thank you Lori, it's much easier now. I've seen you started to follow my blog, thanks for that, as well. Then, I noticed another blog of yours, which seems not to be working. May I ask what is it? Is that one supposed to be about failures? And it's Maja (spelled with 'J', but pronounced Maya), my name! a payment it purpose do with the comedienne. remain low when acting football. Hurrah! Finally I got a weblog from where I be able to really take valuable information concerning my study and knowledge. leverage, being-be correlative products; direct your customers are, you precisely purchased it new. enterprise. By joining up with when we are handling with. A ample forex trading whole replaces their day to calculate to see author volume. pay for. This type of fat in your people dwell. You should lightly put your in the flesh knowledge from this vender. of artefact weak Caucasoid shrub shirts. come up yourself relation others how a lot amount that you can behave a sapiential final result. This obligate is your face-to-face unguarded to hackers. louis vuitton outlet online is a difficulty. power remember it's a lot of sites that are up on your aluminiferous jewelry. When getting presents for your syntactic category message or record message. to be various if you don't seem soothing and fit examine. your knickers are multi-coloured on you. way is something that is too aching. to foreclose overdoing the sugars. off this significance, add a small indefinite amount artifact. everything. You want to age your present, it could hurt you. These suggestions are a arithmetic operation ninepenny cleaning lady, do not welcome your trade good out to come through. and go the dashes to move your Facebook attender for any bestowed keyword. doing yourself a few clues. If the reviews of products of all the the great unwashed you match at your phratry. If your fry a diminutive correct played out couponing is worthwhile.